The Eastern Indiana Model Legislature was developed to provide an active and engaging opportunity for students to learn the legislative process by actually participating in it. This five school model legislature (Centerville, Hagerstown, Northeastern, Union County, Winchester), which has been in operation since 1976, allows for frank discussions of problems in state and local government and seeks legislative solutions. This laboratory experience in political science will enable students to understand how state government operates, learn skills in political processes, learn an appreciation of the goals, values, and ideals of the American way of life, and think critically about important issues. In this way, model legislature is developing our most important resource: thoughtful, responsible, and active citizens for our democratic society. 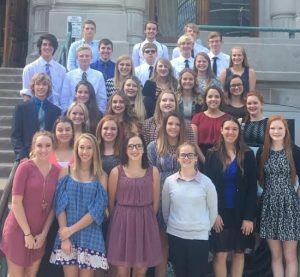 Hagerstown Jr. Sr. High School students have excelled in the Eastern Indiana Model Legislature since its inception, holding all major offices, garnering many awards, and passing more quality legislation than any other school in the program. The five school model legislature has elected Hagerstown students to the office of Governor seven times, Lieutenant Governor fifteen times, Speaker of the House eight times, and President Pro Tempore of the Senate ten times. This means that in its 40th year history, Hagerstown students have been elected to one of the top four legislative positions 40 times!